Event Plan 2017 Handwritten on Small Chalkboard. Red Small Chalkboard with Handwritten Business Concept - Event Plan 2017 - on Office Desk and Other Office Supplies Around. Top View. 3d Rendering. Are you interested in corporate event planning? Hosting an event is one of the better ways to motivate employees. It also attracts attention to your brand if done right. 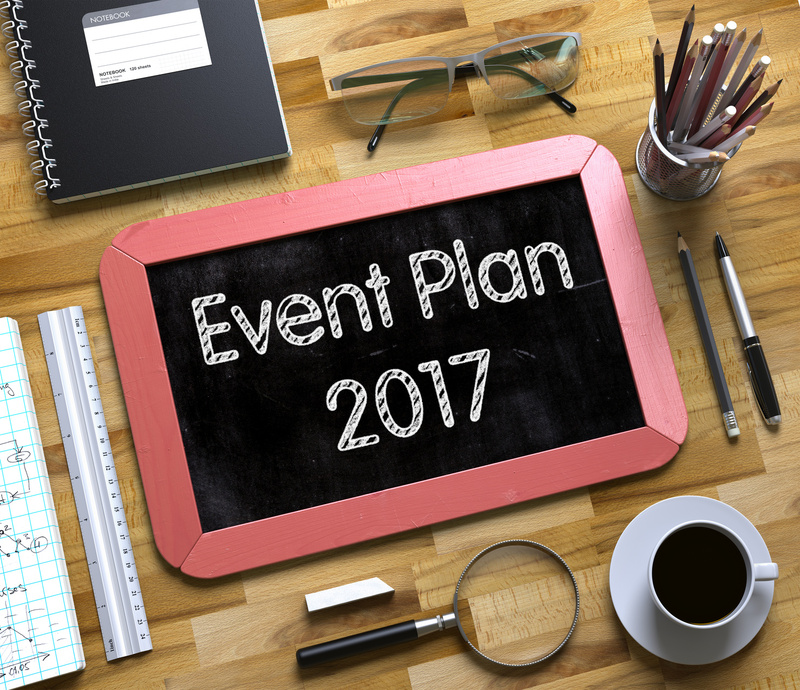 However, the arduous task of corporate event planning can be a bit startling if this is your first go-round. Piecing together a memorable experience doesn’t just happen on the fly. It takes careful planning and management. We’ve tapped into some expert advice from corporate event planning gurus like BizBash and Tim Decker to carry you through all of your steps with five helpful hints. Step 1: Target your demographic. It would be a huge embarrassment for your company if you were to throw a corporate event that completely fails to engage your demographic. Create a tone and ambiance that suits your crowd. Find the right venue. If you are reaching out to middle-aged farmers, then try to keep away from anything that might be too edgy or post-modern. Likewise, you are not going to move hundreds of millennials to action if you make them feel like they’re crowded in a Bingo hall for the elderly. Successful corporate event planning means staying in touch with your base. Once you know who you are engaging with, then you can structure elements of your event around that core. Step 2: Maintain a list of what you need. Make sure your list contains more than just a few bare bones items. Go above and beyond with your list of essentials. Stay on top of everything from water to lighting. Experts over at Small Business Trends recommend a list including public transportation and parking. If people are traveling in to attend your event, you may want to track down local hotels and amenities. Not only does a comprehensive list provide information for you to help your guests, but you’ll also help yourself. And don’t forget to maintain information on what you’re spending on and how much you spend. Step 3: Corporate event planning requires social planning! You’re creating an event for a bunch of people to come together, so think about socialization and a means to make interaction fun for your audience. Richard Aaron is the president over at BizBash, and he suggests providing guests with photo ops. Photo ops are fun, simple, and good for promotion. If you can get several people to take a picture of something entertaining at your event, then chances are they’ll upload that photo to social media and it will spread across their network. Social media is a great way to attract attention at tradeshows, and hiring a small team of experts to help your social media blitz is also going to be helpful. “We provide things at our events that people will want to take a picture in, we rent giant furniture, giant lounge chairs you have to climb into, and everyone wants to take their picture in the chairs,” Richard Aaron suggested in a Mashable article. “Even just creating a cutout photo where people look like babies and you put your face through it — something silly but memorable — it’s not a big cost to be creative it’s not a big cost to be creative,” Aaron concluded. There are some other great tips for corporate event strategy found in one of our blog articles right here, and you may also use these helpful tips to form a promotional strategy! Step 4: Don’t be cheap with your sponsors. If your event is funded by sponsors, don’t ignore the contributions that they have made to bring your event to life. Lavish them with praise and make sure that they’re comfortable. Make sure that your sponsors are represented throughout the event. Put their logos in places where people can see them, and if they have items that can be handed out in the event, then stock up on those. Don’t let the hustle of planning get in the way of forming meaningful interactions. Create relationships with your guests. If you create memorable experiences with the people who come to your tradeshow, then they’re probably going to consider coming back to your next event. Furthermore, do not overcomplicate your message. Stay direct and keep it simple. The pros over at Proforma Blog encourage you to follow the KISS – ‘keep it simple, stupid’ strategy, and we encourage the same! Hopefully now you are well on your way to forming a successful corporate event planning strategy.